Scytl online voting and results management technology helps The Primary High Authority to ensure an efficient, highly participative and transparent election in the November Open Primary for the French Right and Center, once again demonstrating how innovative and proven technology can be successfully leveraged to support elections of strategic importance in France. The 2 rounds of the Open Primary Election held on November 20th and November 27th resulted in the election of the French Right and Center candidate for the upcoming Presidential Election in 2017. Voting was open to all French citizens, not only right and center party members, and allowed French citizens overseas to actively participate via the online voting channel and the public in general to access the primary results in near-real time. As part of the end-to-end solution coordinated by Berger-Levrault, Scytl provided the technology that enabled over 100,000 votes to be securely cast online as well as the consolidation of over 8.6M votes from over 10,000 polling stations and the efficient, timely and transparent publication of over 90% of the undisputed results in just over 2 hours after the closing of the polling stations. “We are extremely proud not only to have provided – once again - the most advanced and secure technology that has enabled French citizens abroad to register and vote online and provide them with a more effective voting experience, but also the technology and expertise that has allowed for the efficient, transparent and timely consolidation and publication of the Open Primary for the French Right and Center results,” concludes Jean Souto, Executive Vice President at Scytl. French Ministry of Foreign Affairs: Scytl Online Voting from 2009 including legislative elections in 2012 and 2014. French Ministry of Interior: Scytl Candidate Information Management in March 2015 and December 2015 elections; Scytl Online Voting pilot 2014 Professional elections. French Ministry of Education: Scytl Online Voting in 2011 and 2014 Professional elections. 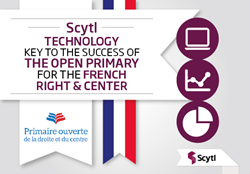 The Primary High Authority: Scytl Online Voting, Scytl Results Consolidation, Scytl Election Night Reporting in the 2016 Open Primary for the French Right and Center. Scytl’s solutions have been successfully used in over 47 countries across the globe over the last 10 years, including Canada, the United States, France, Norway, Switzerland, Bosnia-Herzegovina, the UAE, India, Iceland and Australia. Scytl is headquartered in Barcelona, Spain, with strategic offices in the United States, Canada, Brazil, Peru and Greece, as well as field offices in the UK, Ukraine, Mexico, Malaysia, India, Bangladesh and Australia. For more information, visit http://www.scytl.com.